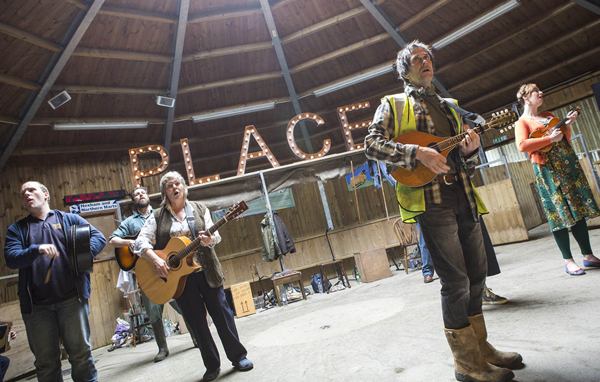 Seven Northumberland villages, a livestock auction mart, Sage Gateshead and Holy Island are all venues for Beyond the End of the Road, a new musical that explores the lives and stories that make up rural life in Northumberland. The tour runs from Friday 2nd June – Saturday 1st July 2017. Beyond the End of the Road is written by Laura Lindow, with music and lyrics composed by Katie Doherty, who has taken her inspiration from folk and traditional Northumbrian music. The musical is directed by November Club’s Cinzia Hardy and the result is an exciting and inclusive musical, exploring rural life in an engaging and innovative way. The story and songs for Beyond the End of the Road have been woven together using ideas and contributions distinctive to each community with whom they have been working. The November Club creative team has travelled the county talking to villagers, collecting local tales and stories, and invited groups of singers to perform at each show. At the end of the show, the audience is invited to take part in a ceilidh called by renowned Northumbrian concertina player Alistair Anderson. The production of ‘Beyond the End of the Road’ is possible by an £85,000 strategic touring grant from Arts Council England, with additional support from the Esmee Fairbairn Foundation, together with The Joicey Trust, Northumberland County Council, Northumberland National Park and the Community Foundation for Tyne and Wear. In collaboration with Highlights Rural Touring Scheme.